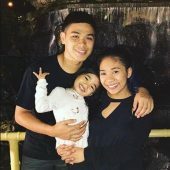 What’s koi fish max size? What do koi fish eat in the wild? 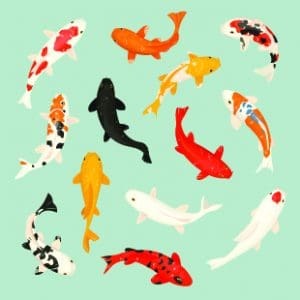 Is a Koi Fish Right For You? Koi are cold-water pond fish that are close descendants of carp. These fish are usually kept in ponds, but can also be housed in large aquariums. These colored fish are usually kept for decorative purposes in water gardens or outdoor koi ponds, although they can also be kept inside in large aquariums. These intelligent fish can live for decades, with many lasting well over fifty years. Because they can thrive in a number of conditions and temperatures, they are an excellent fish to keep for decorative and entertainment purposes. Koi can reach up to three feet in length, and live for many years. In Japan, these animals are very much part of the culture, just as dogs are in the United States. These fish are often passed down from generation to generation and are able to recognize their owners at feeding time. If you are able to take good care of your koi, they might even outlive you! Koi fish start their lives off small – a sharp contrast to the major growth that they put on later in life. When they are first hatched, they are usually only about 1/16th of an inch. Koi generally reach about fifty percent of their final adult length at twenty-four months, enjoying the most rapid period of growth during this time. After the first two years, koi will gradually increase in size, tapering off between ten and fourteen years. Their size depends largely on their environmental conditions (like the pond size and temperature) but other factors like vitamins and lack of stress may also influence their size. The size of each individual koi fish will vary largely depending on its genetics, as well as its particular environment. The larger individuals in this species average around thirty-two inches, with many reaching sizes of forty inches or more. Kohaku: These white-skinned koi have large red markings, and were one of the first ornamental varieties to be established permanently in Japan during the late 1800s. Taisho Sanshoku: These fish are similar in appearance to Kohaku Koi, but have small black markings as well. Showa Sanshoko: These fish are mostly black with red and white markings. They originated in the 1920s in Japan, and are commonly known as Showa in the United States. Chagoi: These fish are usually a pale green or brown, but can also be dark orange, copper, olive-drab, and other shades. THey are a desirable koi breed because they tend to be very good-natured and calm. Asagi: These koi are light blue with red underbellies, but can also be light yellow or cream-colored. Tancho: These koi have single red patches on their heads, and are named after the Japanese red-crowned crane, which sports similar markings. Goshiki: These fish are usually red, but can also range from coal-black to pale blue. Bekko: Bekko koi are usually red, yellow, or white, but all have black markings. Their name is synonymous with “tortoise shell” in Japanese. Butterfly Koi: This hybrid koi species is a combination of traditional koi and Asian carp. It has long, flowing fins and has different color variations. Doitsu-koi: These koi are unique in that they were developed by crossbreeding techniques to be essentially “scaleless”, and more similar to carp than traditional koi. In the wild, koi are omnivores, usually eating anything that won’t eat them first. They will eat foods like plants, algae, worms, snails, and other insects. THeir natural aquatic environment offers a huge diversity of different food sources, so it’s important that you provide a similar replication in your manmade ornamental pond to ensure your koi remain healthy. Koi like to play around with their food, but they can luckily eat a variety of types of food. They should usually be fed with floating pellets or sticks, but can also consume moderate amounts of live food like bloodworms and river shrimp. Make sure you do not overfeed your koi, as this can lead to them being overweight. It can also lead to a buildup of leftover food in the ater, which will pollute the waters of your pond. Only feed your koi the amount of food that it can reasonably eat within five minutes. The exact amount will vary depending on your individual fish, but this is also affected by water temperature. They tend to eat more if the water temperature is high. Your koi may act as though they are always hungry, but it’s important to moderate their food consumption as you don’t want them to create too much excess waste material. The best foods to feed koi are those that mimic their natural diet. In the wild, koi are vegetarians, so consider feeding foods like lettuce, finely diced cabbage, duckweed, or aquatic plants. They will also eat bread or cereals, but try to feed these sparingly and stick to mostly vegetables. These fish are naturally found in Central Europe and Asia, with various carp species originally domesticated in East Asia as a food fish. They are coldwater fish and can survive in a number of conditions. As a colorful descendant of carp, koi were bred specifically for their motley coloration, and have been kept in captivity for thousand of years. Koi are usually kept in an outdoor or indoor pond, as opposed to tank. This is because koi can grow incredibly large. They live for a long time – up to thirty years – and the environment that best produces these long-living fish is one that is spacious and well-maintained. The ideal pond size for raising healthy, long-lived koi should be at least 1,000 gallons of water. They need about three feet of water in order to stay cool in the summer and warm in the winter, as they will swim to the bottom. A thousand gallons is enough room for five koi fish. Koi fish can survive in a range of water temperatures, and are relatively cold resistant. They can survive in most climates, but do not like sudden temperature changes. As long as the bottom of the pond does not freeze, and larger portions of the water surface are kept open for gas exchange, they can remain healthy even during the most chilling months. That being said, koi do not do well in direct sunlight. If your pond is in the sun, consider providing some sort of structure that will create a shadow for the koi to relax within. Koi also benefit from things like fountains or waterfalls, which provide additional oxygen and keep the pond water fresh. Proper water filtration is vital for koi, meaning you need to keep the water well oxygenated and clear any and all waste in an efficient manner. Use a high-volume filter to save yourself time, and add a bottom drain to your koi pond for easier cleaning and water changes. You should consider adding an external filter that is well-suited for the exact size of your tank. You might also consider a carbon filter, which will remove toxins and impurities in the water to help keep it extra clean for your koi. 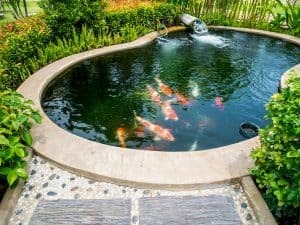 You should also add a heater to help regulate the temperature if you are keeping your koi indoors, as well as a cover to prevent them from jumping out. Regardless of whether you house your koi in a tank or in a pond, make sure you check the pH regularly. Koi prefer a neutral pH between 7 and 9. If you are keeping your fish indoors, put the aquarium in a quiet area that is well out of the way of direct sunlight and drafts. Try not to cover the bottom of your pond with hard gravel or rocks, and instead choose a smooth bottom or even fine gravel. Koi spend most of their time at the bottom of the pond, and often make contact with its surface. If it’s too rough, they could scratch their bellies and develop a serious (potentially fatal) infection. That being said, they do like to have some bottom layers of substrate through which they can sift. You can provide them with a mixture of small gravel or soft sand to make sure they don’t cut themselves. Chinese Hi Fin Banded Shark: These fish will also help eat algae to keep your koi extra healthy. Goldfish: These fish come from the same family as koi, and while they can generate a lot of waste, they add a bit more interest to your pond. Catfish: Catfish are bottom feeders that can easily coexist with koi. They can help keep pond floors clear, and while they can grow quite large, they are usually regarded as non-competitors of koi. In general, koi are friendly and will not pick on your other fish. They like to be fed by humans, and will even begin to recognize you once they are comfortable with you. They may exhibit signs of stress upon being first introduced to their ponds or tanks, and will usually skip out on feedings or hang out near the bottom of the pond. If your koi seem to be acting odd, there are several symptoms that indicate that they are feeling under the weather. If your fish have unusual swimming patterns or abdominal swelling, clamped fins, inflamed or discolored fins, or a change in appetite, you may a sick fish on your hands. A sick koi may act extremely sluggish or exhibit uncoordinated swimming patterns. The most common koi fish diseases are parasites, anchor worms, ich, fin rot, dropsy, and pop eye. Koi with parasites will usually start gasping for air or clamping their fins. Anchor worms, a type of parasite, are white, stringy worms that attach to the fish and result in small white spots and odd swimming behavior. This is easily treated with antibiotics. Fin rot is a bacterial infection that results in a change in behavior, inflammation of the fins, and even missing fins. You will need to isolate any infected fish and treat with antibiotics. Dropsy is also a bacterial infection, and your koi will have bloating or a dulling of color. Pop-eye is caused by unknown conditions, and cause the eye to turn cloudy. It usually is an indirect result of poor water quality and must be treated by a veterinarian. Most diseases of koi are caused by poor water quality. By ensuring that your water is clean and of an appropriate temperature and pH, you can prevent most symptoms of disease in your koi pond. To do this, try to avoid overfeeding your koi. They will act as though they intend to eat everything you give them, as they are voracious eaters, but often they cannot keep up. The food waste will instead sink to the bottom of your pond and lead to the development of algae and certain bacteria and parasites. Consider installing a filter or investing in waste-cleaning fish species like catfish or snails to help prevent this as well. Rather than breeding koi, most people prefer just to bring them home as young fry. Young koi tend to cost less than adult versions, and are easier to keep healthy than to try to hatch koi eggs. That being said, if you decide to try and breed your koi, there are a few things to keep in mind. Koi fish will produce thousands of eggs when spawning, and while hundreds of these eggs can hatch, most usually will not survive past their youth as they will be eaten by larger koi or other fish (like goldfish). You will know your koi are breeding if they swim about lazily and don’t disturb each other or the water. The, they will begin attacking each other and being incredibly active. The water may also develop a strange smell. Spawning period is usually in May or June. Once koi eggs are fertilized, they will cling on plants for a few days (usually three or four). Once the eggs have hatched, the koi fry will sink to the bottom of the pond and take cover in pond plants after they have escaped their yolk sacks. Young koi do not need to be fed for the first few days, but once they begin to swim to the top of the water’s surface, they are indicating that they are ready to be fed. Young koi have very small mouths, and should only be fed liquid food or small particle foods for the first few months. They should be fed three or four times per day. Once your koi have hatched and grown into young fry, you will need to keep an eye on their growth. Small, poorly developing koi should be removed (via the process of culling) to ensure that there is enough pond room for all of your adult koi. This may seem cruel, but it is a necessary part of ensuring the health of your entire tank. An interesting fact about koi is that they are known to jump. When they jump out of the water, they can usually wiggle their way back in, but if they jump too far out of the pond, they can die. You need to keep an eye out for this behavior, as well as for predators. It is very easy for hungry animals like raccoons to reach right into your koi pond for a snack. As a result, you should consider installing a protecting fence or netting system to keep your fish safe. As a new pond owner or the owner of a large aquarium, you might find yourself overwhelmed by the myriad options of fish species available. Koi are a great choice if you are interested in having an ornamental fish with tons of different color varieties. Regardless of size, koi tend to maintain the same colors and patterns throughout their entire lives. These docile fish are a great choice if you have plenty of room, and should be considered for anybody looking to make a major decorative statement in their backyards or living rooms in particular.